An Ancient Solar System...: Why does the JUNO probe have a 'vault'? The JUNO space probe has pulled into orbit around Jupiter. It’s mission? Study the giant planet itself, analyse it’s gravity for patterns and look beneath its cloud tops. 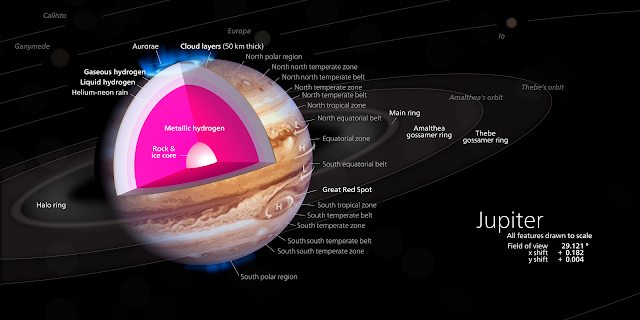 Above: An infographic of the Jupiter system of moons and rings, courtesy of Wikpedia. But why does the space probes design include a vault? Is NASA hauling bullion out there? Although there’s the seed of an awesome conspiracy theory in there. The radiation environment around Jupiter is ferocious, to say the least: A hugely powerful magnetic field, that traps charged particles and accelerates them to enormous speeds, emenates from the planet. On top of that, immense electric currents run between each of the four major moons and Jupiters cloud tops, stirring up even more high speed particles. So the whole volume of space around Jupiter is seething with radiation, concentrated around two immense radiation belts. 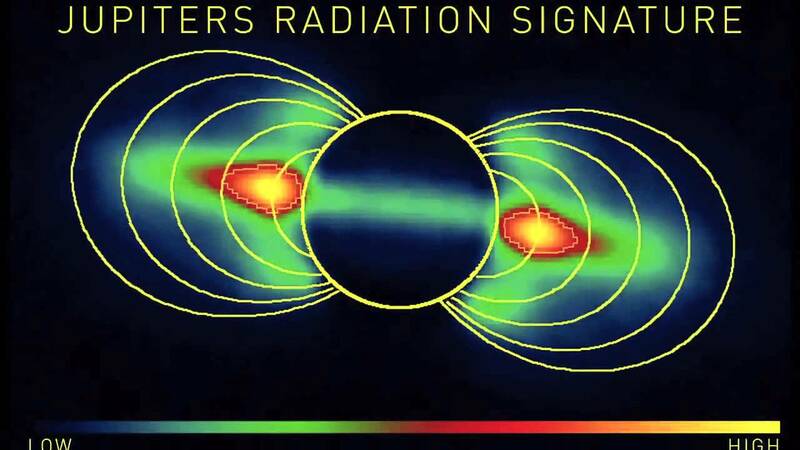 Above: A map of Jupiter's radiation belts. Inside these belts organic matter (i.e. you and me) would quickly break down, and even on the surface of Jupiters moon Europa an astronaut would be dead of radiation poisoning pretty damn fast. The radiation is so intense that even robots are affected. Each of those high speed charged particles can not only destroy human DNA, it can damage the workings of a space ship’s computer. JUNO’s orbit puts it on a path that avoids the worst of it, but even so it’s brain is nestled in a heavy-armoured vault that will reduce radiation levels by 800 times, in order to make sure the probe can carry out it’s 18 month mission. Above: NASA gives us the low down on JUNO. As for what the details of that mission are, I’ve got a nice post already worked up. Juno is still adjusting it’s course, but when it gets into its final science orbit there will data aplenty for science types, and stunning images aplenty for everyone else.